Hello friends. Happy Sunday to you all. The first snow fall of the season has arrived creating a pristine blanket of snow on the landscape. I just love looking at the snow when it is undisturbed. There is something very serene and calming about fresh fallen snow. Perhaps it is the picture perfect scene that it paints or the childhood memories that it brings. But whatever it is, I find it captivating and inspiring. 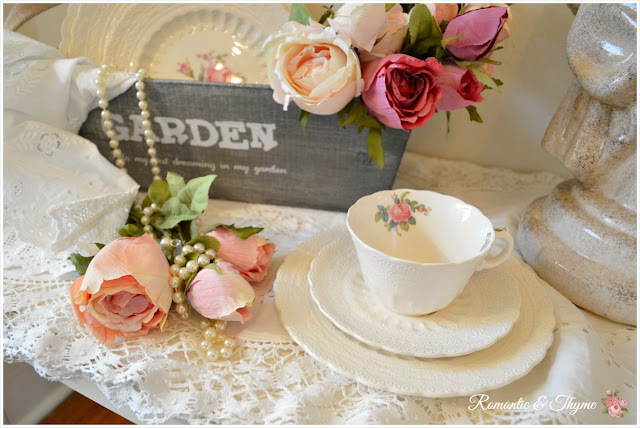 I have made a few trips to Michael's to pick up florals and decorative accessories to incorporate in my home decor. 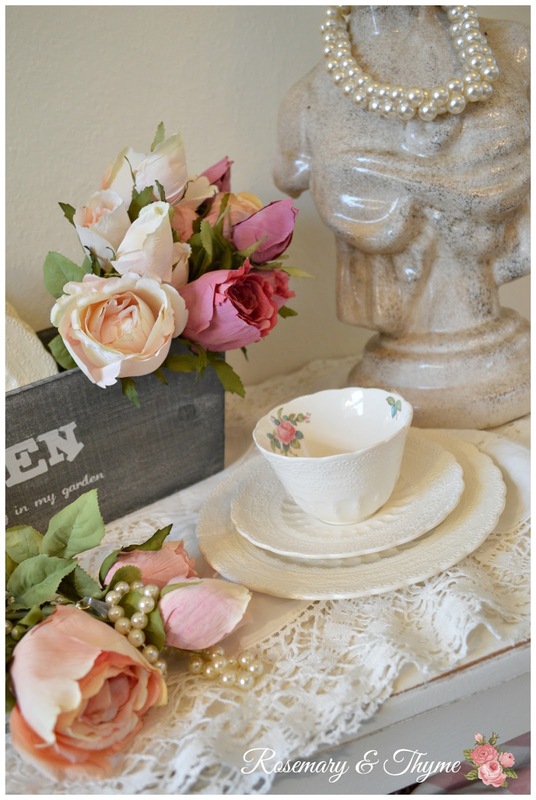 And I must admit, I have developed a little obsession for faux flowers. The choices and quality available these days is very impressive. My creative side is certainly on overdrive, making faux floral arrangements, paper mache boxes and Valentine's Day favors. All which I will share soon. So today, I gathered a one of those pretty decorative pieces and faux flowers to create a sweet vignette that it's sure to lift the spirits and bring a bit of color to a bleak winter day. Enjoy the softness and romance. Thank you for stopping by. May you have a beautiful week. That turned out very soft and sweet! You have a natural flair for decorating. Lovely! Je vous remercie tout d'abord pour votre très gentil commentaire laissé sur mon blog, il me touche beaucoup. C'est toujours avec un immense plaisir que je viens visiter votre univers. J'aime le raffinement et la composition de vos photos. Thank you for visiting Martine. I do appreciate your lovely and kind words. Such a gorgeous winter vignette and boy did I need it this morning! Thank you, it's 2 degrees outside, so this made my morning. Love your stylish photos Janet! Thank you Olympia. I do appreciate your sweet comment. Oh this is beautiful !!! And I love your choice of colors - I a pink girl foe sure !!! Blessings. Lovely to brighten a cold day. Have a good week Janet. Oh Janet. how truly lovely - so soft, feminine and romantic - puts me in the proper mood for preparing for St. Valentine's Day! Well done, it's gorgeous! Gorgeous! :-) I want my whole home to look like this! 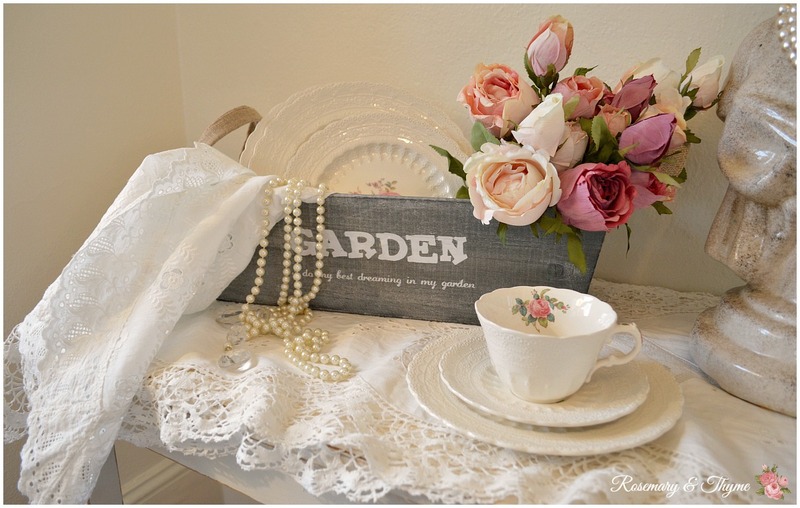 Wow Janet, what a beautiful way to add some color to your home with the pretty faux flowers! Very pretty! 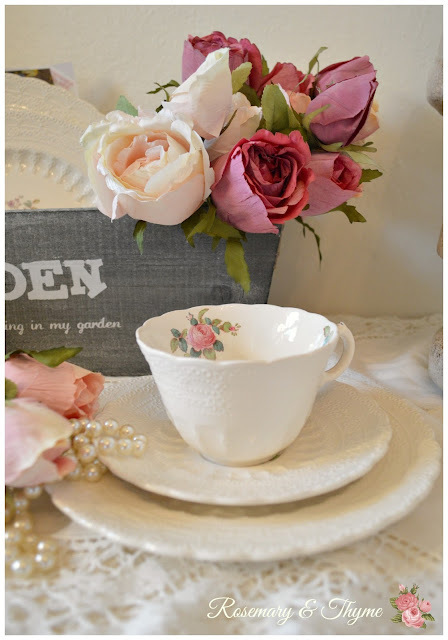 Michael's does have very nice faux flowers...a little pricey but hey, there's a 40% off coupon to use! Janet, this is gorgeous! I have always admired your china pattern; so soft and delicate. 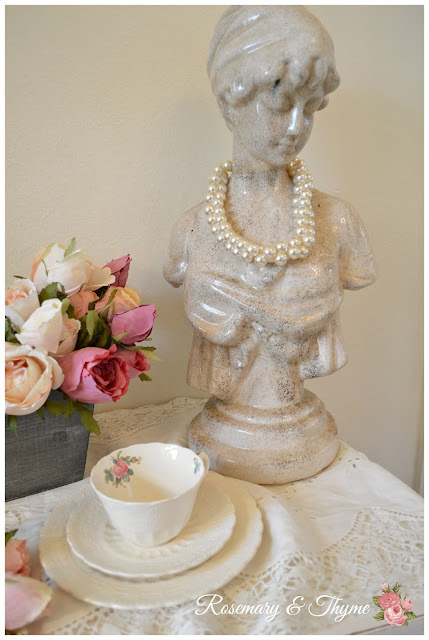 Your faux roses are lovely and of course your pearls add a romantic touch. Thank you for sharing at No Place Like Home and have a beautiful day. Very pretty, Janet! Your faux flowers could have fooled me! very pretty indeed! thanks for sharing. love these shots. Thank you Betty. You are very kind. Oh Janet, your settings are always so dreamy and romantic! I want to come stay at your house and take in all the beauty. 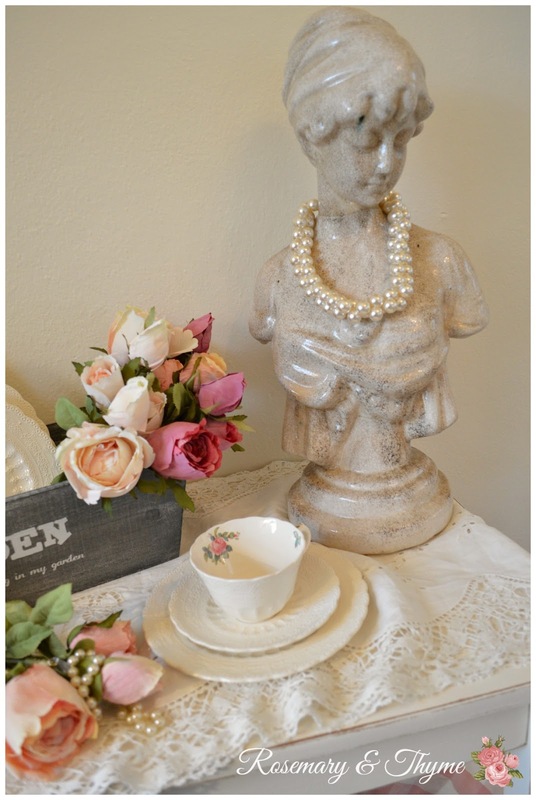 Your trio goes perfectly with the gorgeous flowers you picked up...love the look with the pearls and the bust of the lady. Thank you for such a beautiful comment. I loved reading each and every word. I hope you give the paper cones project a try. It's a fun project for the kids too. Always so gorgeous my friend! 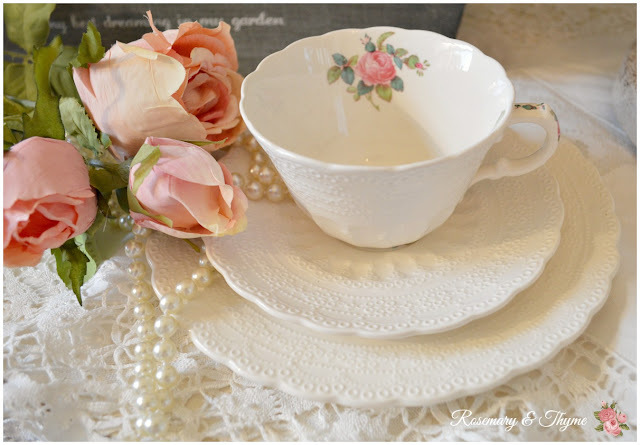 I need to make beautiful vignettes for tea time like you and take good photos too! Devine. Thank you Fabby. You are always such a sweet friend. I love your romantic touches. The roses look like the real deal. I will be featuring this post tomorrow on my featured blogs! Congratulation and thanks for sharing. Thank you Anne. You are very sweet and kind. It is my pleasure to join SYC each week. I will be featuring your lovely post at my No Place Like Home party tomorrow, Monday. Enjoy your day. Thank you Sandy. That is such a sweet surprise. 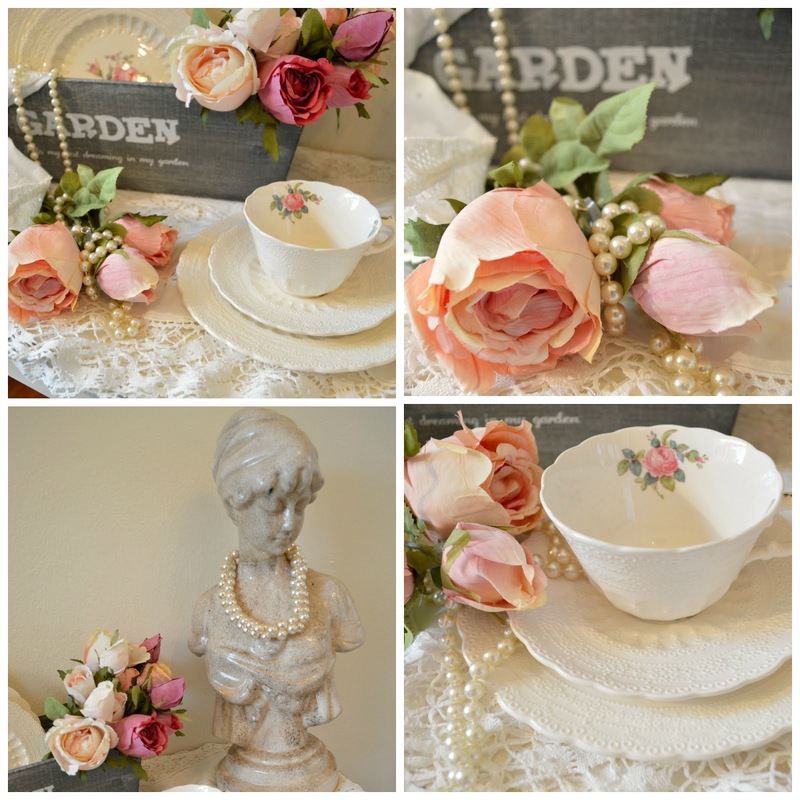 Your vignette speaks "Spring" to me! 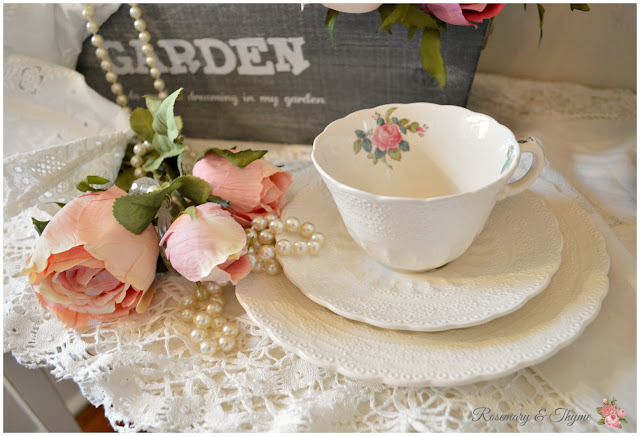 I'm so glad you added this to the Thursday Favorite Things Linkup! Thank you Shellie. I do appreciate your sweet comment. Janet, it is very beautiful! 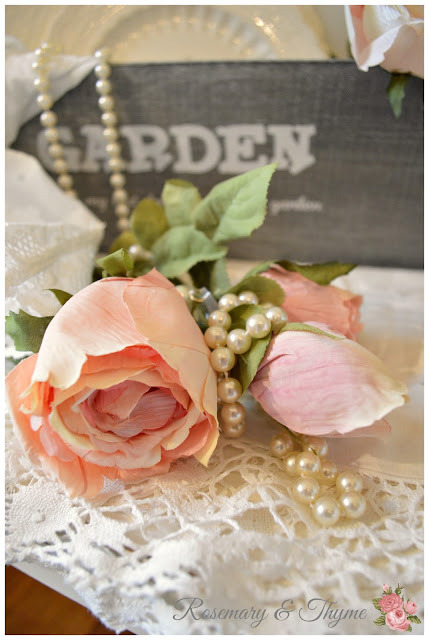 I agree that the faux flowers now days are gorgeous. If you had not said, I would have thought they were real. Thanks for sharing with SYC. So lovely! Thanks for sharing at Home Sweet Home!